Industrial solar has been seen as viable renewable energy, but unforseen environmental impacts have cast a shadow on its future. Industrial solar is a renewable energy resource. A lot of desert communities taking advantage of the opportunities to allow solar “farms” to have access to long-term renewable energy. Southern California has some massive solar sites, situated mainly in the desert regions. Solar technology is an amazing way to create renewal energy, so much so the State of California has mandated that up to 33% of its energy come from renewables and the Ivanpah site fulfils some of that goals. The Ivanpah solar site, situated on 3,500 acres along the corridor between Los Angeles and Las Vegas boasts it will create electricity for more than 140,000 homes. 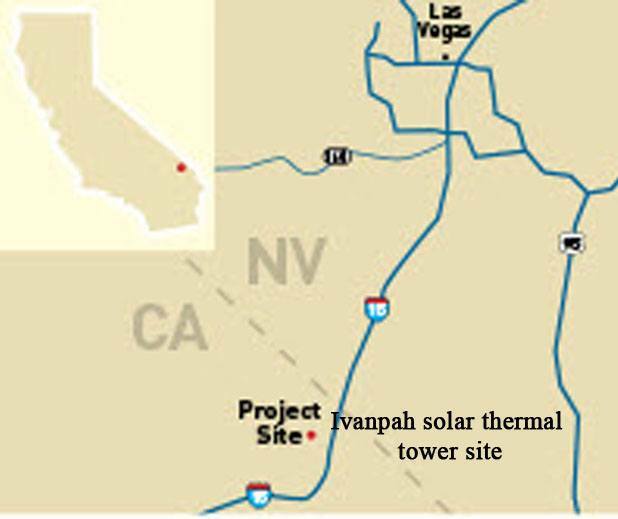 Unlike the typical photovoltaic panel system that is installed on residential homes and acreages, the Ivanpah uses a solar thermal power system to create electricity. It utilizes thousands of mirrors to reflect sunlight to three massive towers in the center of the complex. At the top of the towers are boilers. When the concentrated sunlight strikes the boilers it produced superheated steam. This steam is then piped down to turn turbines, creating energy. When they built this system, one of the largest in the world, they didn’t consider one environmental impact when they designed and built it: bird kills. Recently, US Fish and Wildlife Service published a report on their findings of bird kills at this and two other large solar sites. Birds are literally going up in flames at times. These superheated and targeted streams of solar heat directed at the boilers are creating temperatures upward of 800 degrees. That intense heat is burning features when these birds fly into the “flux field” between the mirrors and the towers. From June 2012 to December 2013 140 bird carcasses were found at Ivanpah, of which one-third of which likely died from the solar flux. Noted injuries were feather curling, charring, melting and breakage. Deaths due to solar flux were as a result of their flight features being charred or burned to a point they could no longer fly. Many were small passerine birds including finches and warblers that feed on insects. The insects were drawn in by the mirrors. Hawks and other birds of prey deaths were also noted, assuming that they were targeting the smaller birds as their next meal, and were also caught in the superheated solar beams. The company’s own consultants estimate than 1,469 birds a year are being directly killed at the solar tower site, of which 898 of which could be attributed to solar flux. The second most common cause of death at Ivanpah was impact trauma, as a result of flying directly into the mirrors. It is believed that because the mirrors reflected the blue sky, birds may have mistaken for water in the desert area. 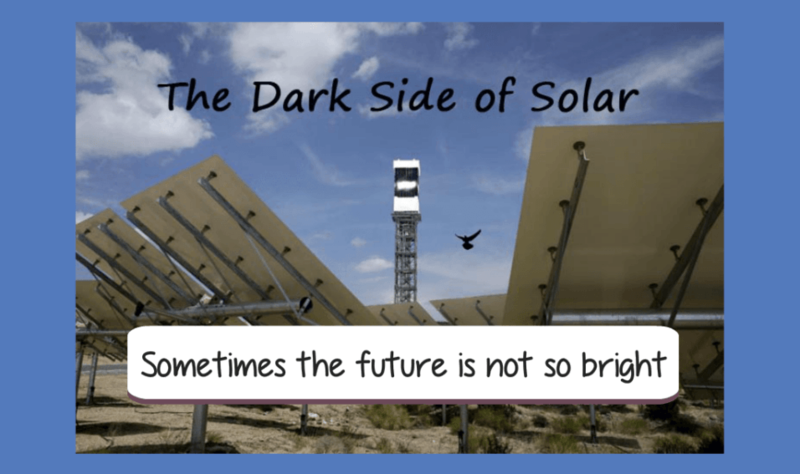 At the two other sites the USFWS looked at for bird deaths, predation was documented at the photovoltaic sites, mainly associated with impact force drama associated with hitting the cells, similar to when a bird hits your window and is knocked out. At the Desert Sunlight solar site, waterbirds were most affected due to the open water source present. Aquatic birds including pelicans, grebes, great blue herons, and even the Yuma clapper rail a federally endangered species, was recorded in the death count. The solar panels fooled the birds into thinking that they were seeing water. The energy companies responsible for these industrial solar sites are taking this problem seriously. Since discovery of the problem bird deterrents have been installed at Ivanpah, hoping to reduce bird activity in the area. Their main deterrent is a machine installed at the top of one of the towers which a concentrated grape juice extract into the air at regular intervals, 45 minutes of every hour. It is also considering repositioning heliostats to cut down glare, anti-perching devices, sonic deterrents, and water containment to keep birds from scavenging the area for food. There are future plans to build another solar thermal power plant in Palen, California which is directly in the pacific flyway, the migratory route of thousands of birds each year. This would also directly impact birds on the flight path between the Colorado River and the Salton Sea. The Salton Sea is a major resting and foraging spot for over 100 species of birds including golden eagles and peregrine falcons. 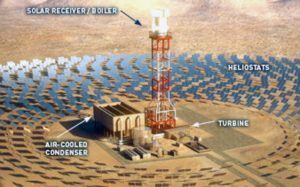 This new solar plant is expected to be twice the size of Ivanpah and would produce a solar flux area that would be more than 3x as large as the existing towers at Ivanpah. As a proposed mitigation effort BrightSource is proposing to pay $1.8 million for anticipated bird deaths, but it does nothing to negate the major impact to migratory and local birds where this solar facility may be built. The Palen Solar Power Project is currently under review by California Energy Commission. How about a better way to live green? Check out this Renewal Construction Materials article, or discover the benefits of a tankless hot water heater.